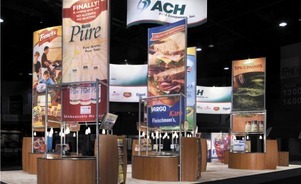 In a crowd of competitors using heavy, wooden exhibits, Navarti turned heads while saving money with a pair of 40’-by-30’ custom modular exhibits. 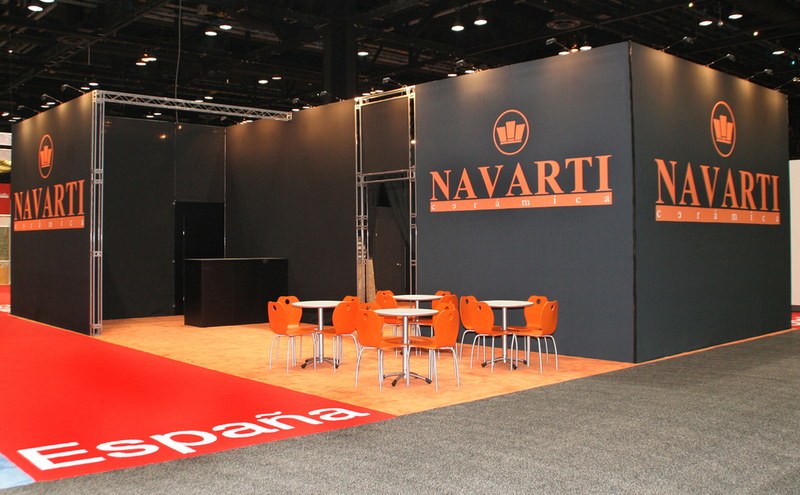 Navarti stood out in sharp contrast by switching to modular structures that are lightweight yet sturdy enough to hold 165 pounds of tile on a single panel. 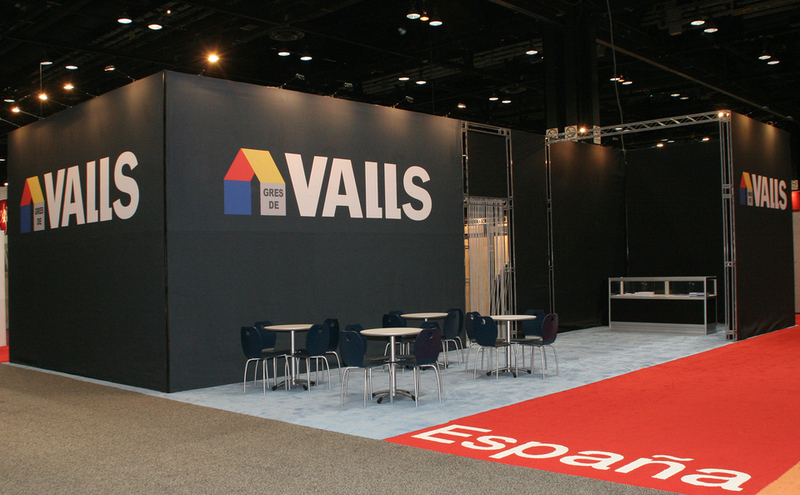 “We were looking for an exhibit system different from that normally used in the ceramic tile market,“ says Julio Mayorga, Product Manager. 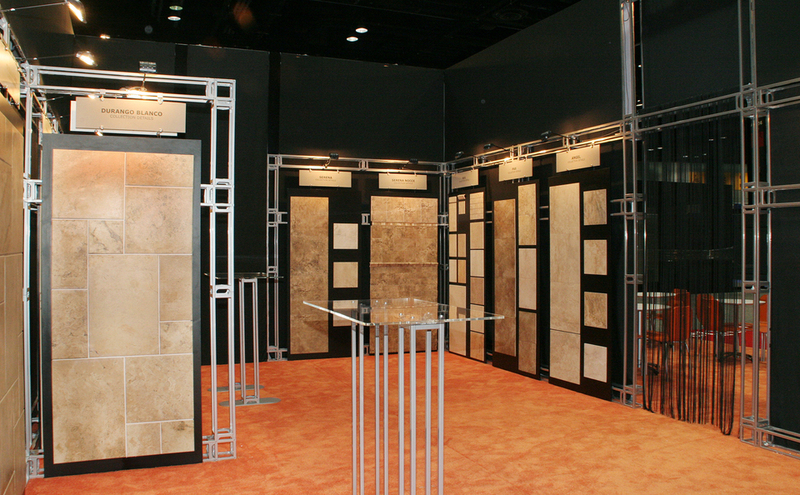 Skyline designed the exhibits – one for Navarti classic ceramic tile and one for contemporary tile and design products from its Gres De Valls sister company – to work in tandem. 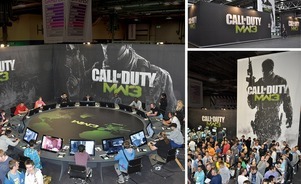 Social areas created a welcoming connection that spanned the aisle, much like a town square. The interiors simulate art galleries by focusing all attention on product displays. Mayorga says Skyline was “the perfect solution“ because it has a dealer in Spain, where Navarti is headquartered; manufactures in the United States, where Navarti would be exhibiting; and designs modular solutions, which allow Navarti to lower operating costs. Compared to traditional custom exhibits, the Skyline exhibits pack compact and lightweight for savings on shipping and feature quick setup for savings on installation and disassembly. 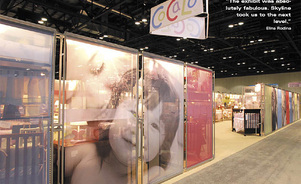 “Modularity also allows us to easily reconfigure the booth as our needs change from show to show,“ Mayorga says. More than two dozen, 8-foot-high baby photos made it impossible to resist a peek inside. 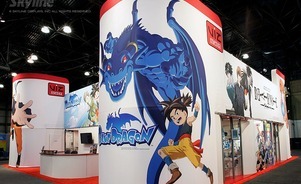 Exactly the desired effect for the new 20'-by-100' CoCaLo, Inc. exhibit. 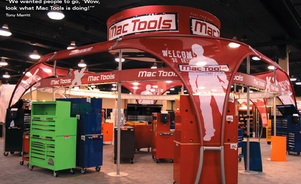 A color-coded exhibit ratcheted up results at a high-stakes private show introducing new products from Mac Tools.